An example of my typical brand of (bio)chemical humour. Happy new year, everyone! It’s been a long time since I’ve posted here at the chemistry blog, but as a totally-not-a-New-Year’s-resolution I’ve decided I’d like to resume posting here at least semi-regularly. A few years ago I had a minor burst of artistic creativity. This primarily concerned chemistry-theme puns of a mildly romantic nature. Having recently defended my PhD and with a glorious eight weeks of pure, unadulterated freedom in hand until I started my first job, I sat down and drew out some sketches that later turned into actual, real Valentine’s Day cards. I posted them to reddit and had a pretty good response. Chemjobber posted about them on their blog. Mark Reich of C&EN even wrote a little blurb about them in the Newscripts section for the February 8th issue that year. As a result (the lesson here being never encourage a person like me) I made some more the following year, posted them to reddit again, and had a similar (though slightly less enthusiastic) response. This year I had some more time at home, having taken parental leave after the birth of a child. Quite literally while holding a tiny baby, I managed to make a fresh batch of five cards for Valentine’s Day 2018, and even to re-do the artwork for the original 2016 set (which originally suffered both from my childlike drawing ability and my utter lack of experience using Adobe Illustrator). Having refrained from posting about it here for the last two years I figured now was as good a time as any to break my (very long) post drought here on the Chemistry Blog. You can find 2018’s crop of Valentines here. You can find all of the Valentines here, including the re-done batch from 2016. Because nothing says “Valentine’s Day” like an endearing groan or sigh from the one you love. One of my professors once told me quite categorically that if you can smell someone’s chemistry, they are doing a bad job. His point was that any chemist worth their salt would be doing stinky things in properly-maintained fumehoods, and never exposing themselves or their colleagues to whatever unholy stenches their reagents possessed. To a certain extent, I agree with him. I’ve never had to brave the foul miasmas of things like isonitriles and I never plan to, but if that eventuality arises you can be sure that I’ll do that in a fumehood. Or possibly in a fumehood inside a fumehood. But for most people who work in chemistry labs, the occasional waft of bizarre odours is not unusual. Sometimes it’s even useful: a project I was doing a while back involved the consumption of phenylacetylene (which has quite a characteristic odour, somewhat similar to styrene), and doing a careful wafting test actually proved to be about as effective for determining a reaction’s completion as a TLC. Not that everyone should smell-test all their reactions! But the point is that working as a chemist tends to give you the peculiar ability to identify reagents by their smell, simply through familiarity caused by repeated low-concentration exposure. The sharp fruitiness of ethyl acetate, the almond sweetness of benzaldehyde, the bitter nose-wrinkling sting of pyridine…there’s an entire world of pleasant and unpleasant smells in the world of organic chemistry, and just like everyone starts to accumulate their favourite and most-hated customers when working in retail, I have a suspicion that each chemist has their own personal list of best- and worst-smelling chemicals. I’m sure we all remember high-school chemistry, and detecting the rancid butter stink of carboxylic acids down the hallway when people did their esterification lab, then getting to smell the artificial rum, banana, and mint flavours that resulted when they did the lab themselves. Smells form very strong memories, and I thought it might be nice to share some of my own memorable olfactory experiences in chemistry, and see what others had to add to the conversation. Note: I should emphasize that I did not go around shoving my nose in bottles of these chemicals, nor should you. Please be careful with all chemistry you do, and always do it in a fumehood for your safety and that of your colleagues. 1. Pentafluorophenol. I did some solution-phase peptide couplings a while back and had to weigh this stuff out on a regular basis. Its physical properties leave something to be desired (so hygroscopic it appears to melt as you weigh it, highly volatile, and not exactly cheap), but its odour is something I don’t think I will ever forget in my life. It smells almost like some non-existent overripe fruit, almost cloying in its sweetness, lingering for quite some time after being capped and removed from the weighing area. It’s one of those smells that I wouldn’t say I enjoy, but it’s so intriguing that I also can’t say that I dislike it, either. 2. Chloroacetyl chloride. I love the smell of vinegar to begin with, but this stuff takes it to a whole other level. Doing carbohydrate chemistry introduced me to this molecule and though I haven’t smelled it since it’s another absolutely unforgettable one. It has a very similar smell to regular old acetic acid, but with this sort of appalling greasiness to it that I always found interesting and somewhat appealing. Similar to this is trufluoroacetic acid, but not only is TFA more dangerous, its odour is so sharp at even low concentrations that it is on the whole quite unpleasant. 3. Methylindoles. Very recently I had the regrettable task of doing some indole chemistry, and I am glad to have it behind me. Though definitely not anywhere near the top of the all-time worst chemical smells, there is something about N-methyl, 1,3-dimethyl, and especially 2-methylindole that I cannot stand. I had the incredibly poor judgement to open a vial of the 2-methylindole outside my fumehood and it’s safe to say that I will never make that mistake again. Similar to that urinal-cake/mothball smell of naphthalene, yet infinitely more revolting, the smell of these compounds will linger for up to a couple hours if spilled or left open outside a fumehood (even after being cleaned up and/or capped). The 3-methyl variety of indole, which I’ve also had the extreme displeasure of working with, is alternatively known as skatole, because it smells like…well, I think you get the idea. 4. Eugenol. Similar to the esterification lab, the extraction of this compound from cloves is a very common organic chemistry experiment in the Canadian university chemistry lab. There’s nothing really surprising about it, because you’re extracting one of the nice-smelling compounds from an already nice-smelling spice, but I think it’s the transformation that makes this smell so interesting to me. You go from cloves–a rich, heady smell that’s always made me think of a spicy chocolate Christmas tree–and when you isolate the eugenol the complexity vanishes, and you’re left with a single note (predictably). The smell reminds you of cloves, but only in the way that esters remind you of their fruit counterparts. The smell is completely one-dimensional, and though pleasant has none of the punch that freshly ground cloves do. There’s just something about experiencing this one particular element of cloves’ smell, completely isolated, that I love. So, fellow chemists, what olfactory adventures have your studies taken you on? Can anyone come up with a plausible description for the legendary odour of isonitriles? Does anyone have nuanced critiques on the qualities of sulfides and thioethers? Have there been detailed qualitative studies on the nasal SAR of various benzaldehyde derivatives? Or are there people out there with intimate knowledge of specific compounds whose odours they find irresistible? Remember, knowledge is power. And the nose knows. When I was much younger, and my interest in chemistry was just beginning to influence my thoughts of post-secondary school and (a lifetime away) a career, there were hints of my destiny that came in the form of somewhat perverse interests. 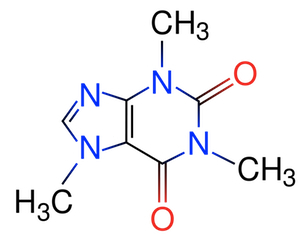 One of these was my profound interest in the chemical constituents of coffee. A non-chemist simply sees a cup of coffee for what their nervous system and digestive see it: a black liquid that tastes bitter, inhibits your appetite, and gives you about a two hour energy boost. However, being the child of two coffee snobs who also happened to be career scientists, I had different notions. What makes a good cup of coffee? People have their preferred brands, countries of origin, or even vintages, if you have that much money to throw away. There are even those who eat an obscenely expensive bean that has been digested and excreted by the Asian palm civet. But can you actually taste the difference? And more importantly, what makes up the difference in flavour? Most coffees are simply described in terms of acidity, roast, and some vague notes about other flavours (vanilla, caramel, berries, chocolate). This, to me, was completely unsatisfactory. Little did I know that coffee flavour chemistry is a legitimate field of study, as is the study of flavours and scents in general. 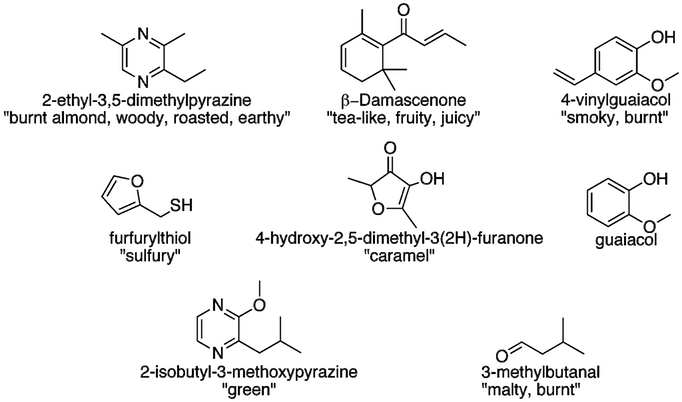 The majority of these compounds are of course formed via the well-known Strecker degradation and the Maillard reaction. These, as well as other important aspects of the roasting of coffee beans, are discussed within the book. Perhaps what I found most interesting are the techniques used to determine what are called “odour activity values”, which essentially amount to a quantification of how strong a compound’s odour is at a given concentration. The methods used for finding these values are actually gas-chromatographic olfactometry, which is exactly what you think it is: they run a GC, and have someone sniffing the end of the column, who presses a button each time they smell a compound. I laughed at this when I read it, not because it’s unreliable (quite the contrary), but because imagining running a column with a panel of “sniffers” at the end instead of a mass spectrometer is quite an image indeed. The original method (GC-olfactometry) was purely qualitative in terms of odours, but later methods known as CHARM (a proprietary technique involving dilution-to-threshold) and AEDA (aroma extract dilution analysis, a similar method) have overshadowed it in recent years. Yet another method, named with a classic, groan-inducing acronym is “GC-SNIF”, which stands for “gas chromatography-surface of nasal impact frequency”, in which panels of test subjects are used to determine how “smellable” a compound is at a single concentration, producing averaged and normalized curves for the detection of smells. Apart from being a funny image, these methods of analysis (which are almost always used in conjunction with purely analytical methods) illustrate an interesting point about flavour chemistry. While GC or LC data, as well as mathematical methods such as canonical analysis or principal component analysis are useful for predicting simple properties, the use of human organoleptic testing is essential to actually understanding the results. Another salient point that was mentioned was the perception of quality. In a 1986 paper, Liardon and Spadone discovered that while the degree of coffee roasting was correlated to a large number of compounds and their concentrations, the quality of the coffee did not appear to be correlated to any of them. One of the few quantitative differences that could be established based on quality was that between green C. arabica and C. robusta beans. Robusta tended to have higher concentrations of methanol, acetone, pyridine, methylpyrazine, and furfural, and also seemed to be unique in that they contained methyl formate, t-butyl alcohol, and furfuryl alcohol, not found in Arabica strains. Robusta beans are widely perceived to be inferior in flavour and aroma to arabica beans, which is why many coffee packages will declare themselves to contain “100% arabica beans” to avoid confusion and distinguish themselves. So what does this tell us? 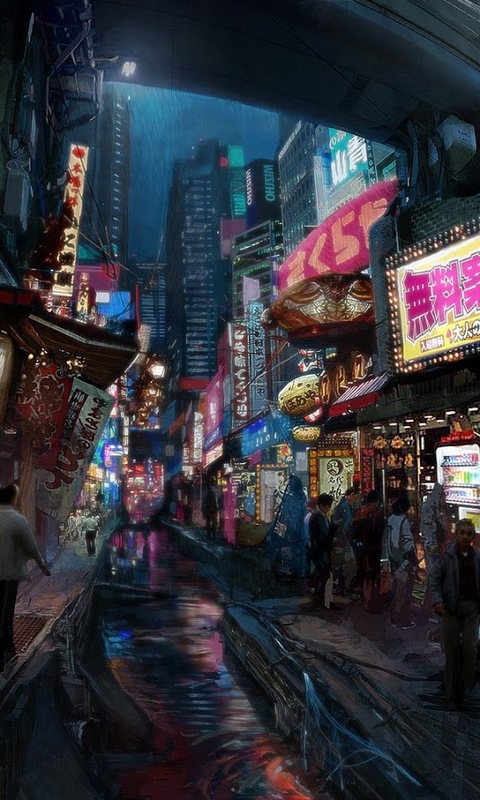 After skimming through the book I came away with two lessons: the first is that while computers and statistical analyses become more and more powerful every day, it seems there is usually a place for subjective human-generated data. Without olfactory analyses from panelists, much of the work on coffee and its constituents would have been completely useless. The second is that while this data is essential to understanding the importance of certain compounds in generating a specific flavour, it is almost worthless when trying to establish a causal link between specific compounds and the perceived quality of the coffee (edit: this is not strictly true for identifying fundamental flaws in the bean due to parasites, mould, or poor growing conditions, which can all be identified by screening for certain compounds). For the most part, as everyone has heard so many times in their life: there’s just no explaining some people’s tastes.